Mike Beitler is a soft-spoken gentleman. Yet his book on capitalism skips pleasantries and cuts collectivism to shreds as antithetical to individualism, productivity, freedom, and reason. I first came to know Beitler via his Free Markets radio show and podcast, where I was a guest a few times. When work prospects brought me to North Carolina, we ended up crossing paths at Ron Paul campaign events and the John Locke Foundation offices. Few men impress me as Beitler did, particularly with his economy and clarity of thought, so his success in finance and consulting came as no surprise. These days he is a management consultant and business professor at Wake Forest University in Winston-Salem, and his most known book is Strategic Organizational Change. That is his textbook for managers, but he has also written Rational Individualism (128 pages, 2008). It crystallizes why he holds strong convictions in favor of individualism and why he fails to fit into the prevailing left-right dichotomy of political rhetoric. Given its lack of fanfare, the quality of Beitler’s lesser-known book took me by surprise. It sat in my collection for a few years, but then exceeded my expectations when I got to it this year. As the subtitle suggests, A Moral Argument for Limited Government & Capitalism, his objective is to explain why capitalism has the moral high ground. Although written in a relatively formal, academic style, he leaves no doubt about his derision towards the incessant desire of collectivists to take from their betters. Since the majority of people are unproductive, socialist ideas and politicians will always have great power in an unlimited democracy.… [and the] morality of stealing from productive people will never be discussed by socialist politicians.… Without productive people, unproductive people and their socialist politicians would starve to death. But the question then is why this book merits one’s attention, over the works of Frederic Bastiat or Ayn Rand, for example — both of whom he quotes extensively (along with a detailed bibliography for further reading). 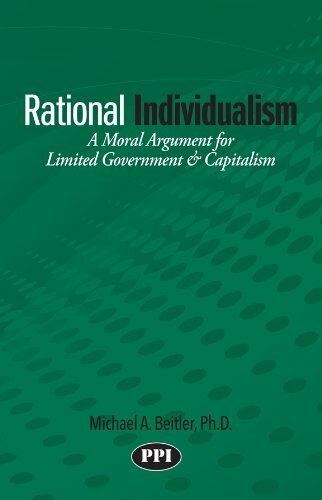 Although Rational Individualism was not intended to shake up or reform classical liberalism or libertarianism, it offers a clean, accessible distillation of the major thinkers in the tradition. The most compelling portion is his two brief chapters on the history of political philosophy and economics. While discussions of a thinker’s character can distract from the content of his ideas, Beitler ties the two together and lays waste to the lives of collectivist stalwarts such as Karl Marx and Georg Hegel. Their life stories suggest they believed contrary to what they preached, to say the least. These chapters are useful because they connect the dots of history, of how individualism and collectivism have evolved over time. Beitler offers a sharp contrast, going so far as to include tables and lists that position the two philosophical traditions at odds with one another. With references to so many of the greats, such as John Locke and Adam Smith, he also invites the reader to explore further. More than invite, he warns rational individualists that they “must be vigilant.” The political rhetoric of a socialist society “will rob you of your individual rights to life, liberty, property, and the pursuit of happiness.” He doesn’t want to see more people become the “cattle” of socialist rulers, as is all too often the case. The only drawback of Rational Individualism is that it is a touch dry, particularly in an age of digital media that provides instant gratification. That is tough competition, and Beitler could have included more contemporary and relatable examples, as Jacob Huebert did in Libertarianism Today, published in 2010. Then again, you take your pick between timeliness and timelessness. Huebert’s book, which gave considerable attention to the presidential campaigns of Ron Paul, will become dated more rapidly. Beitler’s book, albeit less entertaining, has aged well, and the real gold is in the final half, so encourage newcomers to hang in there. It will pay dividends.